PACE Setter (Portland Area Capabilities Exercise) and WASABE (Washington State Annual Bioterrorism Exercise) both took place on May 21, 22, and 23, 2013. 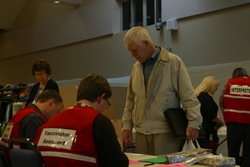 Even though these drills were scheduled mid-week and in parallel, more than 20 members of Clark County (Washington) ARES®/RACES staffed emergency communications stations at the Clark County EOC, the Vancouver Fire Department's Command Center, Fort Vancouver (site of a law enforcement terrorist capture and hostage rescue drill), Legacy Salmon Creek Hospital, the Clark County Public Health Department, and Clark College. PACE Setter, a regional full-scale exercise, was "designed to establish a learning environment for players to exercise operational response plans, policies, and procedures as they pertain to a biological threat and a mass-casualty incident." As such, it involved people from more than 65 jurisdictions in the Portland UASI (Urban Areas Security Initiative) district -- Clackamas, Columbia, Multnomah, and Washington counties in Oregon plus Clark County in Washington -- and federal partners FBI, Coast Guard, Centers for Disease Control (CDC), and FEMA. The Master Scenario Events List was more than 20 tabloid-sized pages in length. exercise tested public health's ability to identify the biological agent and the source of exposure and to plan for a medical response. Day 3 involved setting up a medication center at Clark College and distributing imitation antibiotics to nearly 200 student volunteers. Amateur Radio communicationlinks were established between the County EOC, the Public Health Department, and the exercise POD (point of distribution) at Clark College. Planners wrote a phone system failure into the exercise scenario, and amateur stations passed formal message traffic for the health agency. Amateurs flocked to the 2013 ARRL Hurricane Webinar, which was held Monday evening, July 15. A total of 410 amateurs attended, the highest attendance ever for an ARRL webinar. Administered by ARRL Emergency Preparedness Manager Mike Corey, KI1U, attendees were given presentations on a number of topics including an overview of the 2013 hurricane season forecasts and the role of IRLP/EchoLink in disaster communication by veteran SKYWARN volunteer Rob Macedo, KD1CY; the history and current status of the National Hurricane Center's Amateur Radio station WX4NHC by Julio Ripoll, WD4R; a summary of Hurricane Watch Net activity by Net Manager Bobby Graves, KB5HAV, and the importance of publicizing Amateur Radio communication support by ARRL Media and Public Relations Manager Sean Kutzko, KX9X. Among those registered was FEMA Administrator Craig Fugate, KK4INZ, who posted his attendance on his Twitter feed: "Enjoyed joining other hams for training to prepare for the 2013 Hurricane Season." "It was great to see such a large attendance for this year's hurricane webinar," Corey said. "Given NOAA's Climate Prediction Center's forecast for an above-average season, we all need to maintain a high level of readiness to support our communities. Let's hope it is a quiet and safe one." The 2013 ARRL Hurricane Webinar was recorded is available online. Military Auxiliary Radio System (MARS) members in the US will join Amateur Radio operators in Asia next week (August 26) in a unique test of ham radio's capacity to assist in the event of a major transpacific disaster. Responding to the lessons learned in Japan's 2011 tsunami catastrophe, the US Department of Defense and United States Pacific Command organized "Exercise Pacific Endeavor-13" using emergency standards recommended by the International Amateur Radio Union (IARU). In the exercise scenario, volunteer members of the Military Auxiliary Radio System will establish communication with civilian hams in fictitious "Pacifica" -- actually Nepal -- to gather information for emergency relief operations literally halfway around the globe. Traffic will be forwarded to the United States Pacific Command and the Pentagon's Chief of Information office via an open blog operated by the DoD for international messaging. The information will be used to develop possible humanitarian assistance and disaster response actions to assist the country following a devastating natural disaster. An attempt to relay slow-scan TV images is also planned. While typical disaster drills handle "emergency traffic" in plain language, all message traffic in this exercise will involve a sporting event, to avoid alarming anyone monitoring. MARS operators in designated locations will scan the amateur HF bands around IARU-designated "emergency center of activity" frequencies. MARS participants, including the military MARS stations in Okinawa, Japan and Hawaii, will use Amateur Radio call signs. "The final and youngest victim found was that of the young nineteen year old college student who was working as the ham operator at the time of the crash. Rane Scott Joseph "Scotty" Bernard was a student at the University of Southwestern Louisiana. The 1963 Erath High School graduate was the only child of Mr. and Mrs. Voorhies Bernard. Scotty was a member of the "Five Watts" Club who trained him as a ham operator. He was also a Civil Defense member . . ."
The event requires approximately 60 operators to ensure complete coverage for communications for runner location, logistics, and medical emergencies from the Hydration Stations to the Race Officials. This is a world class event and is a very high profile happening for Amateur Radio. It can be an all day commitment for most operators, so be ready for a long but enjoyable and pleasurable activity. You will get to meet and work with some great people and watch the action up close. We will conduct an in-depth training session on September 14, 2013 at the Beavercreek Township Fire Station, Number 61 located at 2195 Dayton Xenia Rd., Beavercreek, Ohio. The training will start at 6:00 PM. We plan to have guest speakers from the USAF Marathon staff, discuss the frequency and operations planning, open microphone start procedures, general information, and we'll be passing out the goody bags. Amateur Radio operators in Hawaii kept National Weather Service (NWS) meteorologists and local emergency operations centers up to date on changing conditions and power outages, as Tropical Storm Flossie pounded parts of Hawaii and Maui counties July 29-30 with heavy rain and lightning. Radio amateurs organized a joint SKYWARN/ARES/RACES operation using eight VoIP and microwave-linked VHF and UHF repeaters from state and county RACES to serve the NWS, the Central Pacific Hurricane Center (CPHC) and state and county officials. Clem Jung, KH7HO, opened a SKYWARN net from the NWS Honolulu office ham station the evening of July 29 to establish an operational plan. The net reconvened the next morning on the AllStar Link repeater system and on 7.088 MHz. ARES and RACES members also participated. Over its 12 hours of activation, the net recorded 67 check-ins and reports from hams in all four Hawaii counties. Net control stations received reports from throughout the state via Amateur Radio as well as by cell phones and even social media. All reports were shared with CPHC meteorologists. Harvey Monomura, AH6JA, and others on East Hawaii provided ground observations of rain and lightning conditions to supplement what forecasters were seeing via radar and infrared satellite imaging. The state EOC and all four county EOCs monitored the SKYWARN reports. As the storm moved west, stations on Maui reported considerable lightning and rain, and even small hail, coupled with power outages. As the storm diminished, the CPHC gave the okay to close the SKYWARN net on July 30. "This cooperation between the SKYWARN net control stations and the NWS was fantastic," said Jung. "This success was possible because emergency coordinators had worked previously with the Amateur Radio community that participated in this net." I am writing to let you know that I was able to attend the first DHS AUXCOMM course in Nevada this past weekend. It was simply excellent. I learned a lot, especially how to build a good Form 205 and a Form 217a (had never known about that one before). Having been an EC now for 4 years, I wish that the course would have been available when I became an EC. In fact, I think completing this course should be highly recommended by the ARRL, at a minimum. We learned also from a DHS Office of Emergency Communications (OEC) representative, that OEC is considering building a "train the trainer" AUXCOMM course to enable the course to be taught at the local level to expand the course availability. A couple of attendees at this course, held in Reno, expressed disappointment that only hams holding General class licenses and above were permitted to attend. I wouldn't have a problem with having Techs being allowed to attend. I am hopeful that the course will be given again, soon, in Las Vegas. Our oldest son, Chris, became the Chief of the Nevada Division of Emergency Management and Homeland Security Advisor to the Governor, currently Brian Sandoval. He loves the job and working for the Governor. He is ensuring that Amateur Radio and specifically ARES are assets that should be embraced within the Nevada emergency management community. It was due to one of your articles that we had the AUXCOMM course here. A while back you wrote about the course being taught in Utah, so I forwarded it to Chris, and not wanting to be outdone by our neighboring state, Chris followed up on it and, voila', we had the course here! So, in essence, you are responsible for us having the AUXCOMM course in Nevada. Thank you! The ARRL Board of Directors established the George Hart Distinguished Service Award in July, 2009, to be given to an ARRL member whose service to the League's Field Organization is of the most exemplary nature. The Distinguished Service Award is named in honor of George Hart, W1NJM (SK). Hart was a long-time Communications Manager at ARRL Headquarters and chief developer of the National Traffic System (NTS). Station appointments and/or leadership positions held within the ARRL Field Organization. Nominations for the George Hart Distinguished Service Award shall be accepted from anyone and shall be submitted to the Membership and Volunteer Programs Manager at ARRL Headquarters by November 1. Nominations should document as thoroughly as possible the nominee's lifetime activities and achievements within the ARRL Field Organization. It is expected that nominated candidates will have 15 or more years of distinguished service. The Programs and Services Committee will serve as the Review Committee, with the Board of Directors making the final determination at its Annual Meeting in January. Recipients will be given an engraved plaque and cover letter, and will be profiled in QST. Nominations for the George Hart Distinguished Service Award, including any related supporting material and letters of recommendation, may be e-mailed to ARRL Headquarters to the attention of ARRL Membership and Volunteer Programs Manager Dave Patton, NN1N (nn1n@arrl.org) or to ARRL Field Organization Team Supervisor Steve Ewald, WV1X (wv1x@arrl.org). Nominations and supporting materials must be received no later than November 1, 2013, to be considered. I was reminded once again of the old adage "It only takes one to screw things up for everybody else," when I had a sad conversation with an EC who had had his ARES program and volunteers removed from their EOC. One member had undermined the entire organization's relationship by continuing a campaign of complaints and demands to the emergency manager about how Amateur Radio must be positioned and incorporated in the EOC. Incredibly, the individual's campaign ratcheted up to include complaints to the county commissioners. Although relatively rare occurrences, these things do happen. And that is why we need to reevaluate and renew our understanding of our role in the emergency management structure and EOC from time to time, which is the following: It is a privilege, not a right, that we are in the EOC. We are there to provide a transparent service to the emergency manager, who is the professional. We take orders from, and provide communications for messages only authorized by, the professional emergency management team. We are not there to tell them how to run the emergency management function; nor are we there to make demands for things like, believe it or not, sirens and flashing lights for our vehicles. Nor, complain. We need to be quiet assets, heard only when requested by the professionals, and not liabilities. Most understand these principles. But, often it is just one idiot who can destroy all of the long and hard work of ARES members and leaders to gain the trust and consequent invitation -- and privilege -- to serve in the EOC.